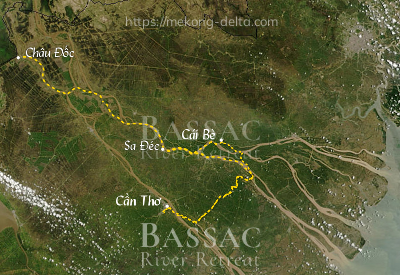 Enquire or book a trip along Châu Đốc - Cái Bè - Cần Thơ - Sa Đéc. We connect through river Vam Nao and around the district of Cho Moi to the First River. Mid-afternoon, we sail along a small tributary to Song Ho. Exploratory visit at Cho Moi: Village and old churches. Boarding back at dusk, welcome drink. Dinner is served en route. the Bassac drops anchor on the way in view of the My Thuan bridge for the night. The Bassac sets sail after sunrise towards Cai Be, through sceneries of sweet water mangroves on river My Tho. Boarding at Cai Be at noon. Welcome drink, departure towards Cho Lach on the Tien Giang river. Upon arrival at Sa Dec, check-out and transfer onto a local boat for a visit and then disembarkment.